Okay, so this is my entry for 's Wallpaper Contest. izumichan, old friend. how are you!? wow. this is a beautiful wallie! i really love how the color scheme match so well together. and the checked border! i just loooove the checked border. its makes the image so much more darling! work, the hair and eyes are scary to think of outlining. Izumichan! Th?s looks so amaz?ng! Youre gett?ng better and better at vector?ng art! I love th?s p?ece! I cant bel?eve you actually took the job ofvector?ng someth?ng Tanemura drew, thats close to ?mposs?ble! Im very ?mpressed. Oh, and by the way, I have already finished reading the manga, and it was wonderful :) I'll tell you what I thought in further detail some other time! ahhh! so so cute kyaumi! :D the wallpaper looks really sweet! 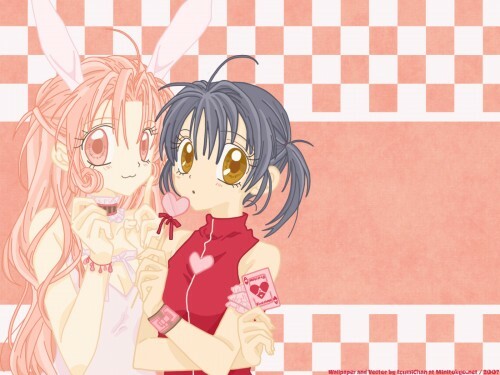 ^_^ Miki and Meroko look so sweet in the scan! ^__^ nice choose! I'm so sorry for getting here so late T_T I check my comments once in... 2 weeks? or even more *is ashamed of self* Well, here I am, mending the mistake! Also, this wallpaper seems to have all the qualities I like in a wallpaper: it's clean, it doesn't sting my eyes and it's cute! ^_^ I especially love the use of the textures and vector combination, I'm a big fan of both! What more can I say? Good luck in the contest, knock 'em dead! XD (figure of speech/idiom) And keep up the very good work! vectored! nice! and is Arina Tanemura's Artwork....difficult! Nice vector style! Oh, yes the monotone pic is simply great! You're improved! Beautiful wallpaper! Mitsuki is cool!